Weight lifting is very popular in today’s health conscious society and offers its own set of health benefits. With the good benefits, as always come the bad. Before you start weight lifting you should consider the potential risks of the sport and be aware of the good and the bad to make your decision. The most common risk with weight lifting is injury. This is a big risk for beginners who are attempting to lift more than their body is able to lift. The quote “no pain, no gain” does not apply to weight lifting. When you start you are beginning to use muscles that you haven’t worked in while, at least in this capacity. Muscle strain is a strong possibility. There is potential for hernias if weights are not lifted correctly and proper precautions are not taken as well. Injury due to no supervision or poor supervision when lifting heavy weights is possible, and this risk can even cause death if you are not careful and you are lifting extreme amounts of weight. Weight lifting during childhood and adolescence can increase the risk of inhibited bone growth due to the additional pressure placed on bones when lifting. Those under the age of 17 should never lift heavy weights routinely. Those who begin body building at a young age need to also consider that once you build those muscles up you have to maintain them for the rest of your life or they turn to fat. 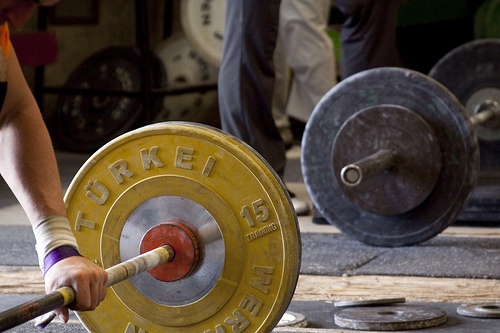 The decision to commit to weight lifting for a lifetime is not a decision to be made lightly. Research has shown that there is new evidence showing that lifting more than half of your body weight can increase the risk of sudden death from a torn aorta. The aorta is the hearts main artery. It is advised by scientists and doctors that those intending to lift heavy weights have a heart screening. This warning is for everyone of any age who intends to do this. Lifting heavy weights increases the blood pressure which causes strain on the aorta. If you have an undiagnosed aneurysm or aortic enlargement you are at extreme risk of death. If you have a history of aortic disease in your family, or even if you don’t and intend to lift half your body weight you should speak to your doctor and have a heart screening. It could save your life.